In California we are in the midst of a record breaking drought that has put a sizable dent in what I'll grow in my edible garden this spring and summer. I'll focus on keeping my existing garden alive and forgo planting edibles in every available corner, but I decided to go ahead with my yearly seed trials for Seed Savers Exchange Member Grower Evaluation Network (M-GEN), and Rancho Gordo's Bean Buddies Group. 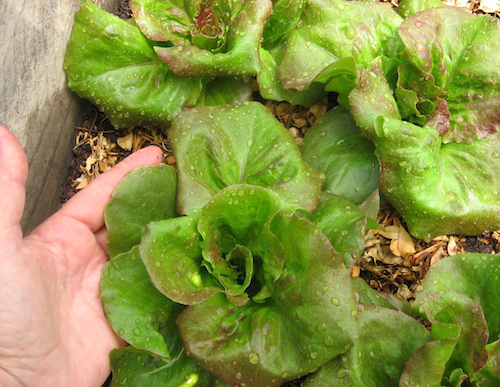 The last two years I tested lettuces through M-GEN that had been grown by families for generations until there was no one left to carry the seeds forward, and a unique variety risked being lost. That's a familiar story. 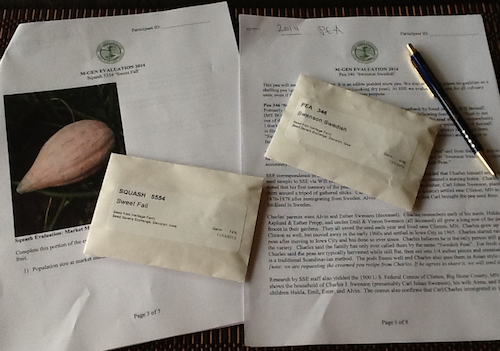 This year when I opened my package from Seed Savers Exchange, I discovered 'Swenson Swedish' snow pea, and 'Sweet Fall' winter squash for my trials. I love the mystery of getting a package in the mail with a special and precious cargo every spring, and I admit I revel in the romance of their stories. Stories carry our collective histories and our favorite foods speak volumes about who we are and where we came from. In 1987 long time seed saver and SSE member, Will Bonsall, received the seeds "out of the blue" in the mail after the elder Swenson (Alvin) entered a nursing home. Alvin's son Charles Swenson had sent them from Iowa after reading about Bonsall, who began offering it in the Seed Savers Exchange member's yearbook. Charles still grows them, but he thinks he may be the only family member left doing so. Through the M-GEN team the peas will be spread throughout the continent and beyond, and no doubt become a favorite of families once more. For a map of M-GEN participants click here.